Just for your info, in the real world of stock market which is not free of scams, companies are held responsible but pre announcing quarterly performance and adjusting it as soon as new data appears and finalizing that report 4 times a year in add'l give next years forecast. So it allows one's speculation to be confirmed along the way. 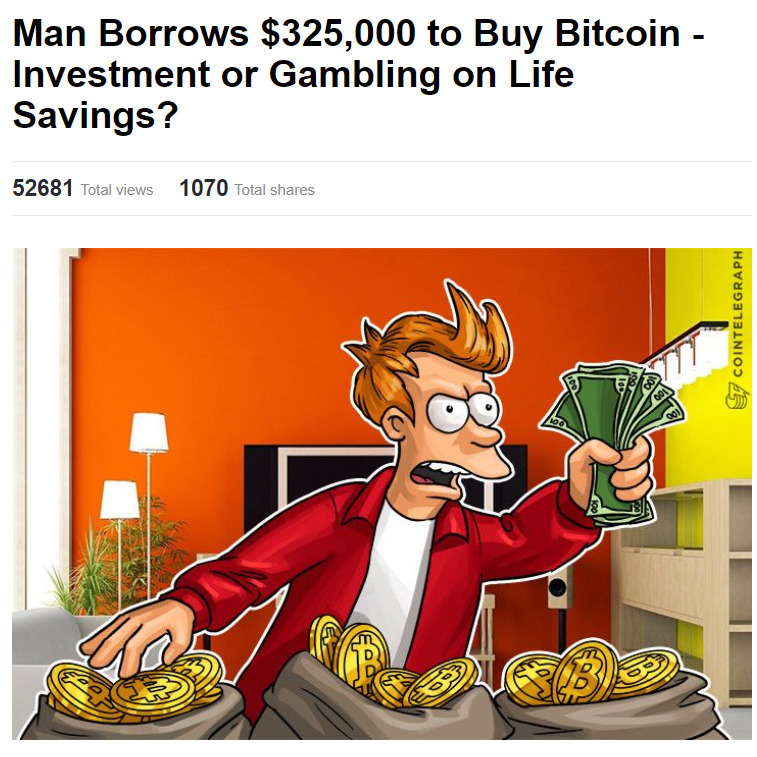 With bitcoin it has been buy cheap and sell higher and theives like McAfee pumping it with no shame. Preserving your capital should be the primary goal. Another horrible day for Crypto, BTC is now down to 7,000 USD ... experts suggests, the end of Crypto is near and BTC should be around 1000 by end of Feb.
Crypto today is like gold. it is a way for you to hege. you should buy it and then just foget about it for five years. in other words, you should not be in this game. if you need the money any time soon. Fully agreed, those who got it to make a quick buck are stupid. I think you should hold (unless you really need the money). yeah, i am down as well, whatever, when i invested, in my mind, i lost the money, so just forgetting about it. kolan emroz market be fana raft. the market has gone up for 9 years straight. it is about time. I wish we get a major correction (20%) down turn. well said , I personally have not gambled my life on it just a few thousands and not that a few thousands are nothing but wont have any impact on my life. Having said that to me it makes sense to keep or lose them all. there was this guy who get a second mortgage on his property and spend them all on coins. these days I wouldn't wanna be that guy . I am waiting for a bounce to sell a couple of these altcoins but will hang on to BTC & ETH & LTC & NEO & QTUM & QMR for the long haul. Venezuela is the first country to create a state-backed digital currency called "Petro" which is backed by the price of oil ($60 at issuance). The state has already issued the currency via a national registry (more than 3 million people signed up). This is a special coin. It's "pre-mined" (no more mining). It's limited to 100 million coins (no inflation) and its users are all identified (national digital registry). Here's the most significant part: Venezuela will soon pay its state employees in "Petro"!!! The state has also deemed it legal and actually encourages citizens to pay their taxes in "Petro"! Well...this should make things interesting. Bitcoin is about to have a real rival. The only thing is nobody takes Venezuela serious and they being bankrupt won't help. The country's economy is indeed bankrupt but there are 31 million Venezuelans and one of the largest oil reserves in the world underneath them. The world cannot afford to not take Venezuela seriously. I think the world will try everything to destroy the whole thing, but if a state says you can pay your taxes in Peshgel, then Peshgel is a valid currency.